CSCS has consulted with the industry and agreed a plan that will pave the way for the eventual withdrawal of the Construction Site Visitor card. All Construction Site Visitor cards issued from 3rd September 2018 will expire on 31st August 2020 and are non-renewable. CSCS will stop issuing the card from 28th February 2020. Click here for more information on the withdrawal of the Construction Site Visitor card. Visitor card holders who do not take the necessary steps to replace their cards will find they will be unable to obtain another CSCS card. What Construction Site Visitor card holders need to do depends on their occupation. You can use the Construction Site Visitor Card Flowchart to find out what you need to, or read the information below. Non-construction related occupations: Many people holding the Construction Site Visitor card work in non-construction related occupations such as security guards and catering. CSCS cards are intended for construction related occupations only, meaning that card holders working in non-construction related occupations will not be required to obtain another CSCS card. Only those in construction related occupations will need a new CSCS card. You can find out if your occupation is construction related by using the CSCS Card Finder. Enter your occupation into Card Finder and follow the steps on the screen. Construction related occupations: Those working in construction related occupations will need to develop plans to move across to the appropriate skilled card for their occupation. For some this will be straightforward as they will already hold the appropriate qualification or membership of a recognised professional body. 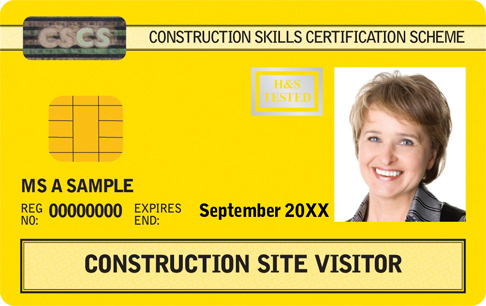 Those working in construction related occupations without qualifications will need to register onto the appropriate qualification before their Construction Site Visitor card expires, otherwise they will not be able to obtain another CSCS card. To find out which card is appropriate for your occupation, use the CSCS Card Finder. Enter your occupation into Card Finder and follow the steps on the screen. Click here to view a full list of the cards CSCS issues. PLEASE NOTE: Cardholders in many specialist occupations, including demolition, plant and scaffolding occupations, will need to get a card from one of CSCS’ Partner Card Schemes. Partner Card Schemes are based on the same standard as CSCS, requiring the holder to gain an N/SVQ and pass the Health and Safety Test. Click here to view a full list of CSCS’ Partner Card Schemes. Should you want to find out more then visit the Frequently Asked Questions page on this website.